Here is the reposting of the tutorial I shared on Bloom. Last year my husband bought me a clothesline. It is one of those umbrella versions, that we can take down when we mow the lawn and during winter. I love it. Hanging clothes on the line gives me a chance to slow down for a moment. The simple task allows my mind to work out problems, ponder solutions, and I can keep an eye on my children playing outside. Bonus, it saves on utility expenses too. Not so flattering photo of me courtesy of the Idaho winds and my 9 year old. I had a clothespin bag, but it was not convenient with a turning clothesline. So, I decided to make an apron. My friend Caroline made a clothespin apron, and I'd seen this clothespin apron a while back, so this is my take. I used part of my husband's worn-out jeans, and other materials I had on hand from making an apron for a wedding gift. So, this was an on-hand project. Your sewing tools, including your iron and ironing board. Step one. Cut out your pieces. For the main body of the apron, cut along one of the seams to open up a leg of your worn-out jeans. Lay it out, and then trim so you have a square about 15" by 16". Your fat quarter will be the large pocket. Cut a square 15" by 15". Then cut as shown here, to create the pocket openings. Step two. Prepare the pocket. Carefully pin two pieces of bias tape to cover the curved edges of the pocket openings. Sew into place. Step three. Attach pocket to denim. The nice thing about using jeans is you can use the original hem. To attach the pocket, I sewed and zigzag stitched the bottom of the pocket to the jean square right sides together. It's hard to tell with this picture (sorry!) but the hem is covered by the fabric here. Now fold the fabric back up, and topstitch over the seam you just sewed. Pin the sides of the apron together, and baste in place. 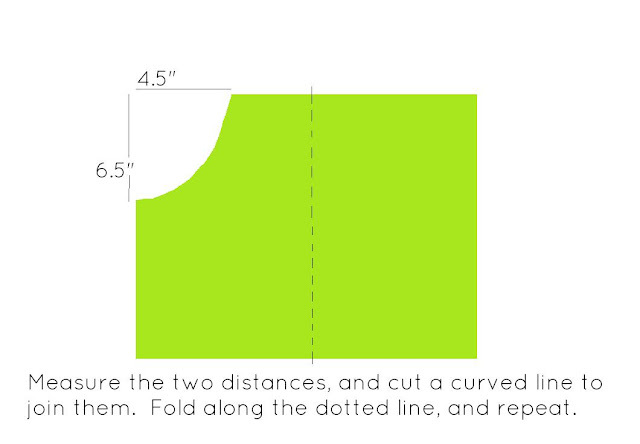 Next, use the bias tape to finish the sides of the apron. I started the tape 0.5" below the edge of the apron, and fold over as shown to cover the bottom edge. Sew just you did the pocket edges. Step 4. Attach the tie. Identify the center of your tie. I do this by folding in half, and ironing in a little mark. Open up the tie, and place the apron in the middle of the tie, matching the center marks. Zigzag stitch to keep in place. Finally fold over the tie, and sew along all edges with a topstitch about 1/8" from the edge. Congratulations, you've made a great apron that will help you enjoy the simple task of drying clothes on the line that much more! Sew Can Do, Tea Rose Home, and House of Hepworths, and Craftiness is Not Optional's Tie One On. That turned out really cute and practical. I bet it could be adapted for different projects where you need lots of 'hand' freedom. You tutorials are always so clear. I really like the mix of denim and printed cotton. I find it is a classic combo and washes so well. I envy that you have the type of yard to hang your clothes out. Thanks, KJ. You are too kind. We really enjoyed our big yard at our old house...now to adjust to the new one. Thanks for your comment on my blog! I love all you fun sewing projects! So glad you stopped by so I could come check you out! That is so cute! You're a girl after my own heart with the upcycled/repurposed denim. What a wonderfully creative idea!!! That is a great idea, love the fabric you chose to go with it! Nice! I have the same clothesline and a clothespin apron has been on my craft "to-do" list for quite some time now! Maybe I'll have it done by next 'hangin' out' season! Thanks for linking this to my first party, Chris! You know I love it! Hope you are well and settling in. Isn't this just the best way to keep those clothes pins with you? Thanks for the tut! Happy Trails!